Whenever we create anything, something happens to us. It isn't just that we form something new that wasn't there before. We actually experience changes in our bodies, minds, and spirits. These changes help us put aside our concerns and enable us to better cope with the stressors in our lives. Our bodies respond to our participation in creative activities, and this response has been noted by scientists. Changes first occur in the brain, just as our stress response does. Michael Samuels, MD is a physician who pioneered the development of creative visualisation techniques with cancer patients in the 1960s. He states that there is a direct connection between making art and increased brain function. According to him, making art causes neurons to fire (mostly in the right brain), which stimulates the hypothalamus which sends messages to the whole body. That in turn stimulates the parasympathetic branch of the autonomic nervous system. Hormones and neurotransmitters (especially, endorphins) are released. This whole sequence can help with relaxation, stress reduction, and body repair and healing. Our bodies, in turn, experience a physical response when we create that can be measured in more relaxed breathing, lower blood pressure, and slower heart beat. Some forms of making art, such as dance, join creative efforts with physical movement, which also has a therapeutic benefit in stress reduction. People who make art become more relaxed and more focused. Moreover, there is an added bonus. 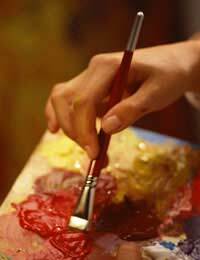 Participation in artistic activities helps people become more creative. Dancing and other forms of making art (visual art, crafting, creative writing, or music) stimulate the brain in different ways to other activities. This stimulation can help a person step into the creative flow which can foster relaxation, increase self esteem, and generate an abundant sense of peace. It is here that we tap the spiritual and the intuitive. Dancing and making art can become a healing time, a step into a retreat space, or a way to take a mental break, in order to return to the everyday world refreshed and energised. Whether you accept the esoteric connections with art or not, Samuels insists that everyone should make art, and that we don't have to be good at it. It doesn’t have to be great art; we just have to get into the process of creating something and enjoy doing it. Children do arts and crafts projects everyday when they first enter school, but opportunities to do that dwindle as they advance through the years, with some high school students and adults never making another thing for the rest of their lives. Human beings need to create. When we create something, we give it our full undivided attention. We immerse ourselves in the process. The music or the paint or the wood or the cake flour or the patch of fertile ground in the back garden lifts us above the problems we have and takes us out of ourselves, even though what we may be creating is very internal. Making art gives us something to look forward to and takes us outside of ourselves. It gives us hope. Men and women can both benefit from making art. Despite popular belief, it isn't an unmanly thing to do, we just need to find something creative that interest us. It can be what we usually consider art--painting and drawing. It can be playing a musical instrument, writing a poem, keeping a journal, building something, doing needlework or sewing, planting a garden, dancing, baking, cooking, restoring a car, making a model, creating a sculpture, working with clay, making scrapbooks, taking photographs, making videos, etc. The list is endless. But, whatever we choose, it should be pursued for pure pleasure. Creating, in this instance, is not another means to schedule yet another lesson or class. This will only create more stress. Unless we really think that a class would be fun, we should probably keep this kind of creating private and purely for our inner enjoyment. Also, we should never be critical of our creations or those of our children. It’s the process that's important, not the product. Samuels suggests beginning a creative session with intention. This may begin by simply penciling in time in our schedules to create and then keeping that appointment. By setting our feet on the path, the process begins. Samuels also suggests continuing that intention by taking a moment after we have gathered our creative tools together to centre ourselves. We can center through meditation, breathing, music, or prayer. This focuses our intention on what we are about to do and also creates a distinction between where we are before we begin to make art and where we are during the process. This step triggers the mind and body to begin to relax and enter into that space inside us where we draw creation from. When we make art, we tap into our creativity and into a meditative space, no matter what we are creating. We also ignite healing and peaceful responses in our bodies.